After a momentary storm post lunch, the dust seemed to have settled at Chepauk; with every over bowled a draw seemed to loom large but only until Moeen Ali decided to exhibit some needless aggression. A moment of madness that would have lasting repercussions in the last session of the series. Moeen Ali stepped out to Ravindra Jadeja; the ball gripped a touch; Ali wasn’t anywhere near the pitch of the ball, and his swing could reach only as far as Ashwin at mid-on. Moeen Ali had just opened the gates, just like how he had done in the previous tests. That brain freeze moment at Chepauk quite clearly showed how England, despite the adversities, could manage to dig a grave for themselves at a time when they were being truly outplayed by India in all the departments of the game, throughout the course of the last one month. There isn’t an iota of doubt in anyone’s mind that Virat Kohli and his men overpowered their opponents and decimated them to hapless souls in need of a long due rest. Cook and his team had a torrid time in dealing with the relentless pressure that was being exerted on them by the Indians at every stage of the game. But, at the same time it was also pretty evident that even tactically, England came a distant second. England landed in India with a baggage of self-doubts infused by a young Bangladeshi spinner Mehedi Hasan at Mirpur. Though, it was believed that the Mirpur nightmare was a thing of the past after England gave India a run for its money at Rajkot, it wasn’t to be the case. With Gary Ballance scoring a string of single digit runs at No 4, something which even a modern day tail-ender wouldn’t be proud of, and with Ben Duckett looking all the more fidgety with every growing day in the sub-continent, Cook was left with little choice. Cook persisted with Duckett and unsurprisingly he turned out to be Ashwin’s bunny in a matter of no time. On quintessential subcontinent wickets, it is imperative to score big runs in the first innings and set up the match; and for that to happen the team needs to have a solid No 4 who wants to score runs every time he comes to the crease. India has Kohli, Australia has Smith, Pakistan has Younus, but England? England’s choice left much to be desired. If Duckett should never have been an option, then pushing Moeen to No 4 was equally staggering. Moeen Ali eventually turned out be to the team’s 2nd highest run scorer with a total of 381 runs at an average of 42. But at 4 lot more is desired; more solidity and less flamboyance is the need. Cook won the toss at Mohali, Mumbai, and Chennai – all were very good batting decks. When his team had already lost 3 wickets in the 1st session of the test, Moeen Ali went for the expensive pull at Mohali only to be holed out, to leave the team at 87/4. At Mumbai, Moeen went after the spinners with some risky slog sweeps in the post lunch session, on a pitch that offered some bounce. 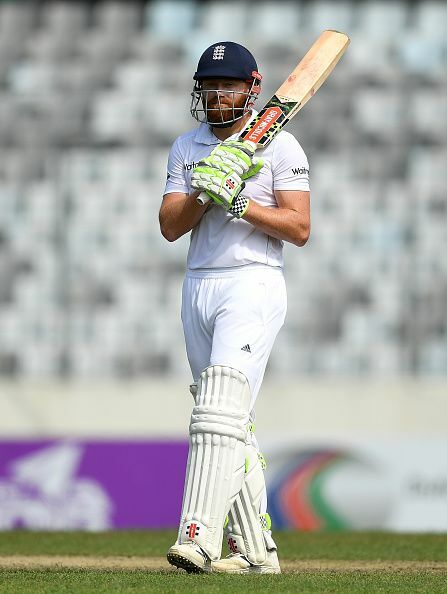 It yielded for a while but didn’t last long; from 230/2 England ended the day at 288/5. At Chennai, Moeen did score a century on the 1st day but on the next morning when his team lost two quick wickets, he didn’t resist his temptation to once again go for the pull which had already brought his downfall. Throughout the series, Moeen showed little signs of a solid No 4 that the team needs. Had Cook given the gloves to Butler and promoted Bairstow to 4, England could have laid a better foundation but that wasn’t the case. After having won the psychological battle over India at Rajkot, England missed the trick at Vizag when it chose to go down the ‘blockathon’ path. It wasn’t a dubious decision for its intent but a dubious one considering the resources England had. Cook sighted the example of South Africa having almost achieved the draw when it batted for 143 overs at Kotla. But that Proteas team had the likes of Elgar, Amla, ABD, Faf and Duminy who could bat long unlike this England side which is full of stroke makers who tend to go hard at the ball, barring Cook, Hameed and to some extent Root. So how wise was the team’s decision? Not only at Vizag but throughout the series, one could sense the confusion in England’s think-tank as to where to draw the line between caution and aggression when countering Indian spinners. As with batting, Cook had his fair share of problems in choosing the right set of bowlers too. In the 1st couple of matches, Cook went in with Zafar Ansari as his 3rd spinner, who proved to be ineffective. So at Mohali, Batty replaced Ansari but was surprisingly very much under bowled. Batty bowled only 18 of the 138 overs in India’s 1st innings. England virtually played the match with only 10 players! In trying to over compensate his selection mistake at Mohali, Cook went in with 4 seamers on a very dry Mumbai surface where spinners ended up picking 27 of the 30 wickets that fell. Stokes who had picked up 5 wickets at Mohali bowled only 10 of the 182 overs that England bowled when India amassed a mammoth 631 runs. Trailing 0-2, when a test match was to be won, why was Cook even trying to under bowl Stokes and think of his workload? One can’t just fathom but only wonder at some of Cook’s decisions! 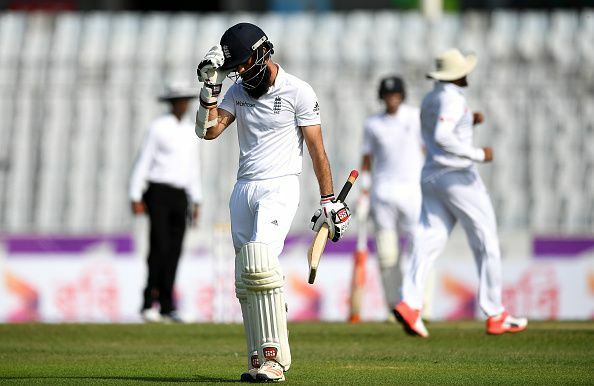 Adil Rashid, despite being team’s No 1 bowler, wasn’t backed enough by Cook. There were time in the series when Cook went to Ansari and Dawson before passing on the cherry to Rashid which was quite baffling in itself. Even at the end of the 4th test at Mumbai, Cook wasn’t sure of his best 11, which only says one thing; apart from the questions asked by Kohli and his men, Cook had his own set of problems to deal with, none of which helped his cause. 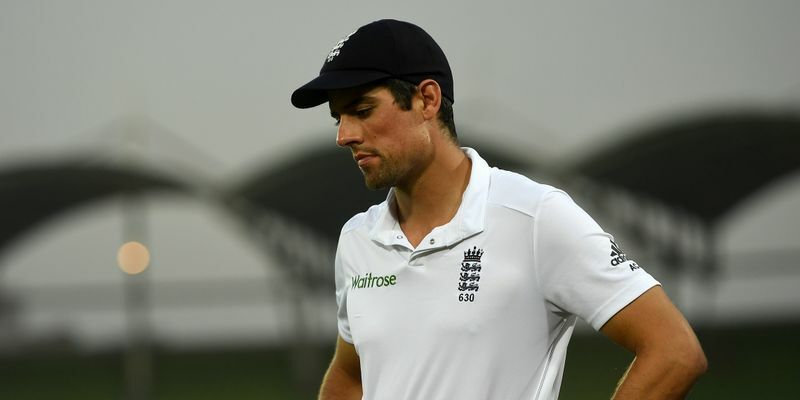 Cook found himself on the right side of the coin four out of five times, but sadly on the wrong side of the result each time. From the highs of 2012, England have descended to the lows of 2016, rather embarrassingly. For Cook and England, the process needs to start all over again, for this series has ended with more questions than answers. Someone once said, Sports is a way of life. I, for one, believed it even before I truly understood what it meant, only to later learn what I heard is what it is. As I write I feel like I'm living the moments, though it is my half baked piece of cake!